With nearly 8 million Americans unemployed and looking for work while nearly 6 million jobs remain unfilled, it’s fair to say that technology has not disrupted the labor market in a good way. In fact, most employers believe technology has made hiring harder. 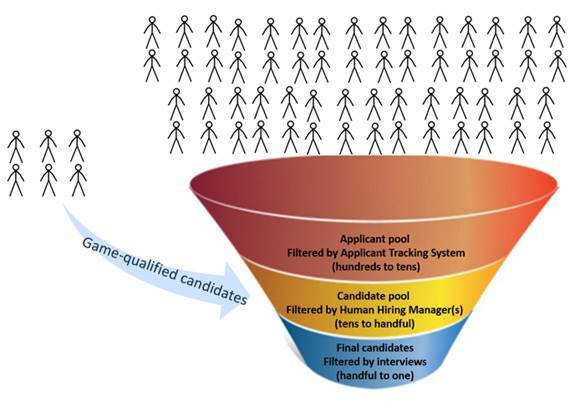 Approximately 85% of job descriptions are posted online, and with each job description yielding hundreds of digital applications — the vast majority presenting uniform credentials (i.e., degrees) that are very difficult to differentiate — the sanity of hiring managers depends on keyword-based filters in applicant tracking systems (ATS) that yield candidate pools that are workable, albeit incredibly imprecise. For any given ATS-filtered candidate pool of, say, 20 or 30, it’s likely that there at least as many false positives + false negatives. For employers and candidates alike, the hiring game has become somewhat of a crying game. That crying is loudest in areas of shortage and where traditional degree/pedigree-based filtering is least relevant. Coding is the clearest example of both. Employers are desperate for other channels and signals that will allow them to source applicants and filter candidates more effectively. Enter companies like CodinGame and CodeFights that are bringing fun and joy back into hiring through gamification. Ever been online and asked if you can code better than an Uber engineer? You’ve just been challenged to a CodeFight. The two-year-old San Francisco company is gamifying hiring by providing thousands of coding challenges across dozens of coding competencies — algorithmic, databaseand front-end — to experienced and first-time hackers alike. Candidates compete against bots or against each other in timed competitions, or against themselves in the self-paced CodeFight Arcade where they brush up on their skills. Challenge, competition and immediate gratification (the “achievement-dopamine cycle”) — seminal elements of every video game you’ve ever played — are deployed for the purpose of educating, sourcing and filtering candidates. Game-qualified candidates circumvent the broken hiring funnel – entering as candidates and, according to CodeFights, converting to hires at a ratio of 5:1, as opposed to filtered candidates in the main funnel who only convert at 30:1. Candidates seem to understand the appeal of jumping the queue. CodeFights reports 1.5 million challenges attempted in the last month, and a customer base that has doubled each month for the past quarter. Gamified hiring allows employers to break away from degree and pedigree-based hiring. Coding is particularly ripe for this, as the rapid emergence of bootcamps like General Assembly and Galvanize demonstrates that colleges and universities aren’t keeping up with employer demand. As a result, talent is evaluated based on what you can do – not where you have gone to school. It’s a fresh, level playing field that appears to result in a more diverse pool of candidates. 80% of candidates placed by CodeFights did not attend an elite university or come from a major tech city like SF or NY. Moreover, 30% of candidates placed to date are women — 3x higher than the Silicon Valley average. And gamified hiring allowed CodeFights to place this transgender engineer. Employers like Uber, Asana, Dropbox, Thumbtack and Evernote have already hired through CodeFights. It seems unlikely that the impact of gamified hiring will be limited to coding. CodeFights Founder and CEO Tigran Sloyan believes gamification represents the future of sourcing and filtering for any objectively measured skill. This includes fields like accounting and finance and any regulated or licensed field where there’s a qualifying exam (healthcare watch out!). It’s not difficult to imagine that games like this become a central building block of our competency profiles. And it’s likely that we won’t wait to play these games until we’ve graduated and begin looking for jobs. Think about all the homework a new college graduate completed over the last decade. If that homework had been gamified, she would have graduated with a massive, highly differentiated competency profile that would allow her to jump the interminable hiring queue. And more of the homework would have been completed. Unlike CodeFights, homework doesn’t provide immediate gratification, competition or new discovery. So watch for postsecondary and secondary education providers to gamify coursework and homework. As hiring is gamified, technology will begin to make hiring easier. And employers and candidates will breathe a sigh of relief that The Hiring Game will no longer be as sad (or as surprising) as The Crying Game.